I was intrigued with each developer’s claims about all you can do with their device. 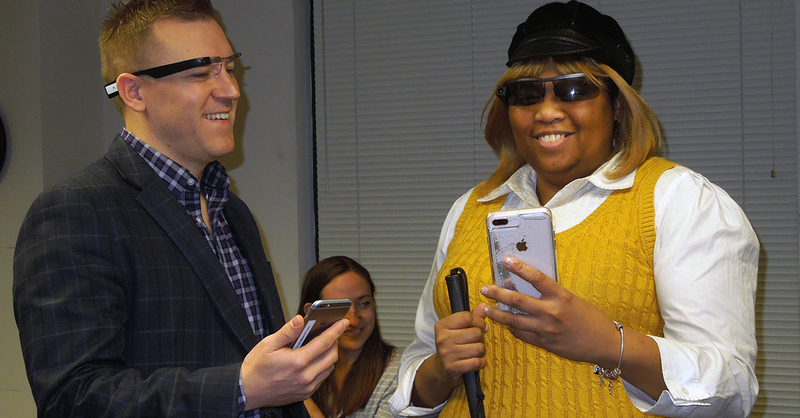 But I soon learned that not every device is appropriate for every person with vision loss. It appears there are two categories of vision enhancements, wearables and implants. So I’ll take you through a little tour of the different options. I will explain what device is right for what type of vision loss, the approximate cost and basic details about the device. Recommended for: People with low vision from conditions such as macular degeneration, glaucoma, Stargardt, and diabetic retinopathy. You must have some useable vision to use this device effectively. This is an off-the-shelf product consisting of a Samsung virtual reality headset worn over glasses combined with a Samsung Galaxy smart phone. As you look around, the phone’s camera automatically focuses on what you are looking at whether it be close up or far away. The image is projected inside the headset, making it feel like you are looking at a large screen TV. You can increase the magnification up to 12X. IrisVision is FDA approved as a Class I medical device. It is being used in ophthalmologist practices as a low vision aid similar to a video magnifier. It is not recommended for walking, running or driving. Recommended for: Individuals with low vision from macular degeneration, Stargart’s, retinitis pigmentosa, glaucoma, diabetic retinopathy, retinal detachment and more. While this device is similar to IrisVision, it differs in the fact that eSight has been designed especially for people with low vision. It also has a higher price tag. These electronic glasses are mounted with two high speed cameras, a video and computer processor mounted in front of each eye. High resolution images are projected in real time in front of you. You can magnify these images up to 14X with reverse contrast capability. Prescription lens inserts are available. The product is FDA approved and clinical trials are in process at this time. Another difference between eSight and IrisVision is that you are able to be mobile – walking, playing sports and, in the future, driving – are possible. Recommended for: Individuals who cannot read printed materials. The OrCam is not a device that enhances vision, but rather recognizes text and objects and speaks aloud via a small earpiece. Two models of the OrCam are available. OrCam MyEye has more capabilities and is able to read text, recognize faces and identify products. OrCam MyReader is only able to read text. The device is a camera that can be mounted on most eyeglass frames and includes an earpiece. Using some basic hand gestures, the camera takes a photo of any text. It then uses optical character recognition to read aloud the text through a small earpiece. To recognize faces and products, OrCam MyEye uses artificial intelligence to identify these objects. OrCam is battery operated, wireless and does not require any Internet connection. Recommended for: People with vision loss from any cause. The Horizon smart glasses are only available with the Aira subscription service. The Aira service connects you directly to a live Aira agent who has been specially trained to assist people with vision loss. The Horizon glasses have a wide angle camera that is connected to a smart phone providing an Internet connection to access Aira agents. These agents use the camera in the glasses to see what you are looking at and talk with you via a blue tooth headset or earpiece plugged into the smart phone. They can do many things to help you like read text, describe the environment and direct your movements. The Horizon glasses are available only with the Standard or Advanced subscription package. Rent-to-own pricing is also available. Recommended for: People with late stage retinitis pigmentosa with bare or no light perception. You are required to get a screening and evaluation by a medical professional to insure the appropriateness of the device for your remaining vision. Cost: Approximately $150,000; Medicare 2019 reimbursement has been set at $152,500 and some private insurance may cover this treatment. The Argus II, sometimes called the bionic eye, is a surgically implanted retinal prosthesis that works with glasses containing a camera and video processor. The camera captures electrical signals that are sent wirelessly to the retinal implant. The implant delivers electrical stimulation to any remaining photoreceptor cells in the retina providing you with artificial vision. This artificial vision helps you see contrasts in the environment such as paved walkways, doorways, windows and people in front of you. After the retinal prosthesis has healed from the surgery, a rehabilitation period is provided. During this time, you learn to interpret the images and to use the device effectively in daily life. The FDA approved the Argus II as a medical equipment device. I realize researchers, doctors and medical equipment companies are trying hard to help people with vision loss be able to either enhance or regain some of their vision. They need people to try out these devices to see how they can improve the equipment. What was off-putting to me was the developer’s claims about what the device was capable of. Often making it sound too good to be true. They don’t mention that you have to wear awkward looking (and I’m sure feeling) glasses, connected to a wire that’s connected to some other sort of processor. They don’t talk about the learning curves associated with the technology. I don’t like the fact they seem to target those who have not adjusted to their vision loss. Who are looking for anything to bring back their vision. These devices are very expensive and are at the beginning of their lifecycle. If you are thinking about purchasing a device, please be sure to investigate thoroughly. Be wary of the claims and multitude of YouTube videos that can entice you. Companies will make improvements to these devices down the road, so your device may quickly be outdated. We definitely recommend you get hands-on experience with the equipment before your purchase. And remember, there’s no substitute for some solid vision rehabilitation training to help you be as independent as you can be. Thanks, Kathy for sharing these details – very helpful.